Where on Earth is Staten Island? That’s probably a question some of you might wonder if you read my upcoming eBook The Dark Proposal. Some of you might have heard of the place from somewhere you don’t remember, while some of you won’t have any idea. That’s OK. Staten Island is used to being called the “Forgotten Borough” of New York City. I should know, because I have lived here all my life. Yep, I was born at the Staten Island University Hospital in 1982, grew up – and still live – on the South Shore, and attended all of its schools, including the College of Staten Island for my undergraduate degree. I take the ferry nearly everyday, and I feel like every time I go into the city, I have to represent my hometown. After all, in my experience, most New Yorkers haven’t met someone who’s actually from the Island – let alone lived there all their lives. So, when my book is released and readers find out about the fifth borough of New York City that no one seems to have heard of, I have the feeling they are going to want to know more about the place. Well, let’s start with the beginning. It was home to the Lenape Native Americans before the Dutch came along in the 1600s. It was later Tory territory during the Revolution (meaning, Islanders supported the British). In the later 1890s, Staten Island was incorporated with Manhattan, Brooklyn, Queens and Brooklyn to form New York City. For most of the 20th century, the borough was empty compared to the rest of the city in terms of population. 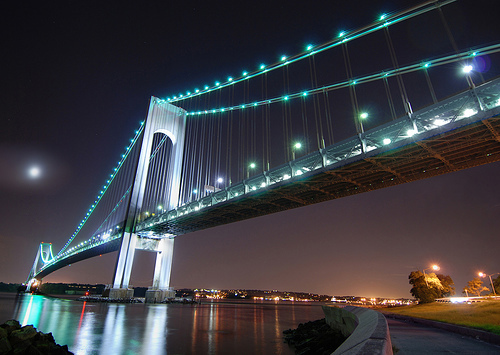 Then the Verrazano Bridge was built in the 1970s, and the population exploded. It continues to explode to this day. Staten Island is known for its large Italian population, though in recent years it has gotten more diverse with the influx of Russian, Sri Lankan, Liberian, Mexican, and Arab immigrants. Although we are nearly 500,000 people strong, we can only one Congressional representative – and that politician has to also represent western Brooklyn. We also only have three City Council representatives while the other boroughs have three times as much. Oh, in 1993, we tried to secede from the city but because of some political leaders in Albany, that has yet to go through. There has been talk of reviving the secession these days. There’s a lot of parks here, a lot of trees and lawns. Not too many tall apartment buildings; you’d find those on the North Shore but not a lot compared to the other boroughs. Some people would say Staten Island is more suburban than urban, and should belong to New Jersey instead (for the record, I say no because there’s no need to pay all those taxes). Staten Island is the birthplace of Christina Aguilera, Joan Baez, Ricky Schroeder, and Alyssa Milano. One of the Jersey Shore cast members hails from here. There was a movie about the Island a few years ago, but it was lousy. The MTV series Real Life did an embarrassing episode about the Island. Oh, Madonna and Lady GaGa filmed the videos to their songs, “Papa Don’t Preach” and “Marry The Night” here and on the famous ferry. Another thing Staten Island is famous for? The friggin’ dump. We are home to the largest landfill in the world, believed to be seen from space. I remember watching that thing grow from my parents’ bedroom window as a kid. It’s closed now and they’re aiming to make it like Central Park in about 20 years. Yeah, a landfill and toxic waste dump will be a place to have family picnics one day. Go figure! So, why did I choose to have my hometown as the location for most of my book, you might be wondering? Well, besides the fact that I am most familiar with the Island, I also want to use my skills to put Staten Island on the map. Like I said previously, I always feel like I have to educate people about the Forgotten Borough whenever I go into Manhattan. I’ve been asked dumb questions like, “Wow, people actually live there?” Incidents like that drive me to want to let people know that the borough does exist and what it is like there. At the same time, the main character, Claire McCormick, attended college on the Island at the fictitious Richmond College, which is modeled after Wagner College, the only sleep-away higher institution here. It was at Richmond College that she met and befriended two other girls – Samantha DiCarlo and Monica Alejandrez – who become her roommates post-college and play a vital role in The Dark Proposal and its two future follow-ups. Also, Monica is going for her master’s in education at Richmond, so it makes sense for the three to stay on Staten Island. I don’t tell too much about the Island in this book because there wasn’t any real room to delve deep into life here. That will come in future books. No, I don’t intend to have every book I will ever write to take place on Staten Island, but a good portion would. After all, this is my home and has been all my life. It would be nearly impossible to ignore this place and not give it a major role in my work. Oh, heck, Megan. I trod on your little corner of green Earth every time I travel from my home in NJ (land of the high taxes) to JFK airport, which is often. Plus, my songwriting partner was born there, and he still has the interesting grammar and syntax to prove it. Staten Island will not be forgotten in my house. Although I could do without paying the VB toll. It’s like like handing over a week’s pay for the honor of getting lost in Brooklyn. I like the portrait of the borough you gave, though my own personal leanings do feel left out by a small omission: the Stapleton Home Port. Sure, Brooklyn got most of the cool ships when the Naval Yard was opened, but the promise of berthing the USS Iowa and her task force, now *that* had to count for something. Hi jdanryan, thanks for your comment! I honestly don’t think much of the Stapleton Home Port except for during Fleet Week in late May, so that is why it was off my radar. I’ve gone to SI Yankees games and they are a lot of fun. Sports and laughs, who would pass that up? Even though I am a lifelong Staten Islander, I have to admit the place is not as entertaining as the other boroughs. I just want to do it justice by saying it does exist and not have it be seen as that weird place that few dare to go to. I swear, when I told people where I am from three separate times this week, I got the usual, “oh wow! people live there?” It’s like we’re the ghosts of NYC. My current book touches Staten Island; there’s no in-depth look at life here and the people. But I plan to do more with future books – not all, but as many without getting too cliched in my locations.